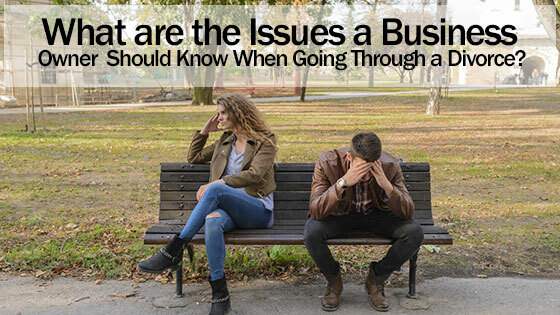 Home » Blog » What are the Issues a Business Owner Should Know When Going Through a Divorce? A Texas Divorce Attorney Helps Explain. Many major issues require resolution when a couple divorces. One such concern divorcing individuals might have is the future of their business. In such instances, consultation with a divorce attorney might prove valuable. The Law Offices Of David Kohm is very experienced in divorce and family law. We invite our followers and potential clients to read this brief blog detailing the possible fate of a business in the wake of divorce and how a divorce attorney can help. A business is considered an asset. In Texas, how assets (also referred to as property) are legally defined plays a critical role in what will become of them when a couple separates. When a couple residing in Texas divorce, marital assets are divided in accordance with the community property principle. This means that all assets accumulated during the marriage are subject to division. Separate property is deemed an asset one spouse or the other had prior to marriage or was either gifted or inherited. Therefore, when determining the fate of a business, a conclusion must be drawn over whether the establishment or entity is considered community or separate property. For example, if the husband and wife started the business or worked together to build said property’s equity after they wed, both spouses would be entitled to their fair share of the associated assets. However, if the entity was gifted or came to the spouse through inheritance, said establishment might not be considered community property. In Texas, a separating couple’s marital property is also subject to equitable distribution. However, equitable does not always guarantee an even fifty-fifty split of all assets. A court will determine the most fair and balanced way of dispersing assets after considering factors such as each spouse’s income, each partner’s individual assets, how much each spouse contributed to the accumulation of community property, the earning capabilities of both partners, each individual’s age and overall health. Such circumstances could apply to a business. Even if a business is not legally classified as community property, the non-owning spouse could still benefit from the business indirectly. For example, if the business provided the owning spouse a source of income for the couple during their marriage, said asset could factor into a court’s final property division rendering. The most efficient method of making this determination is through the process of valuation. Obtaining an honest and accurate assessment of the entity’s value is critical and proprietors are advised to entrust this task to a professional evaluator. Said professional will go about reaching a specific conclusion by performing tasks like reviewing financial statements and evaluating assets. Once the business’s exact worth is established, the process of dividing said entity’s assets becomes somewhat more manageable. Additionally, receiving a professional evaluation might prevent one spouse from accusing the other of deception. A professional evaluator will define all assets and present said property for all parties to clearly see and understand. The asset distribution aspect of a divorce, especially in relation to dividing a business entity can be rather confusing. Individuals potentially facing these circumstances are encouraged to retain the services of a divorce attorney. The professionals at The Law Offices Of David Kohm can review your case and provide counsel regarding the possible fate of their client’s business.